The Kikid programmes aims to develop a real dialogue with underage people about themes that are important to them such as alcohol, drugs, relationships and sexuality, social media, money and debt, peer pressure and (cyber) bullying. 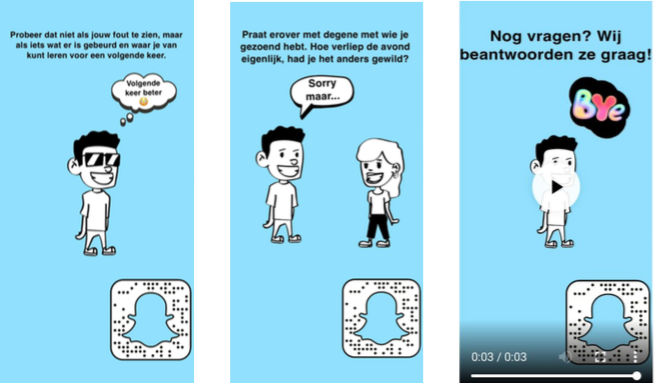 In March 2018, Kikid launched a snapshat account. Every Thursday between teenagers can ask questions via Snapchat for one hour. Twice a week a “story” is posted which includes about 7 snaps with a question or a tip. 400,000 young people have been reached online, generating on average 150,000 impressions a month. A video explaining the project and a website containing more information is available here.